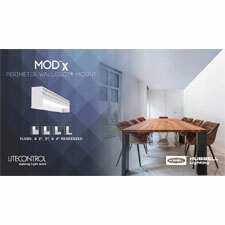 Greenville, SC – February 26, 2019 – Litecontrol announced today it has enhanced the MOD™x portfolio of Pendant, Wall, Surface and Recessed linear luminaires with the launch of the MODx Perimeter. Litecontrol’s leadership position was established five decades ago when it introduced architectural slot lighting to the industry in response to the demand for value-oriented, full-family ambient lighting solutions. Much has changed in the decades since, and lighting technology has certainly evolved but the values, needs and desires of lighting designers working on commercial projects remains the same. Designed to elegantly illuminate the edges of a room, wall or surface from the ceiling to the floor, the MODx Perimeter is ideal for any commercial indoor design. It can be flush, or regression mounted at 2″, 3″ or 4″ deep with a Narrow lens for a “wall graze” effect with target uniformity to highlight texture or a point of emphasis, a first for any product in the MODx family. It can be installed with straight extensions or as part of a Wall/Slot corner pattern. It is available in 2″, 3,” 4″ and 6″ wide apertures and varying CCT from 2700K to 5000K at 80 or 90 CRI. To complement specific architectural design ambitions, MODx Perimeter features four lens options. The traditional soft diffuse and blade baffle are available, as well as the asymmetric and new narrow lens for more optical control. By integrating the optical control into the diffuser, itself, Litecontrol eliminates the need for costly optics, further adding to the value of the product. The current MODx family is offered with a Lambertian and Asymmetric downlight distribution. Now joining that lineup is a batwing diffuser along with a .5″ Drop Lens narrow beam option exclusive to the MODx Perimeter. For more information on the entire line of MODx products, visit the family site HERE.